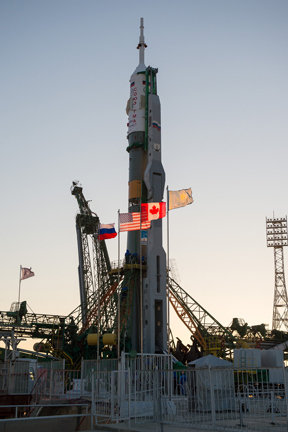 Looking forward to Christmas in orbit, a second-generation Russian cosmonaut, a Canadian shuttle veteran and a NASA physician-astronaut made final preparations for blastoff Wednesday aboard a Soyuz spacecraft bound for the International Space Station. With spacecraft commander Roman Romanenko at the controls in the command module's center seat, the Soyuz TMA-07M ferry craft was set for launch from the Baikonur Cosmodrome in Kazakhstan at 7:12:36 a.m. EST Wednesday (GMT-5; 6:12:36 p.m. local time). The son of veteran Russian cosmonaut Yuri Romanenko, who blasted off on the first of his three spaceflights from the same launching pad 35 years ago, Romanenko will be assisted by veteran Canadian astronaut Chris Hadfield, seated to his left, and NASA astronaut Thomas Marshburn, strapped in to his right. "This is only a business trip for us," Romanenko joked at a pre-flight briefing. "I spent six months in Houston and three years ago, I also spent six months in orbit. So for us, it's nothing special, it's only saying goodbye for a short period of time. Four hundred kilometers is nothing, Houston is even farther from Moscow than the station!" If all goes well, Romanenko will monitor an automated approach to the International Space Station, docking at the lab's Rassvet module around 9:12 a.m. Friday. Standing by to welcome them aboard will be Expedition 34 commander Kevin Ford and Russian cosmonauts Evgeny Tarelkin and Oleg Novitskiy, who were launched to the lab complex Oct. 23. Docking will come just four days before Christmas, but Marshburn, who visited the station during a 2009 shuttle mission, said the crew is prepared for the holiday. The crew faces a busy flight schedule that includes a full slate of scientific research, routine maintenance, a Russian spacewalk and the arrival of Russian and European Space Agency cargo ships, along with two U.S. supply craft making commercial flights under contracts with NASA. A Dragon cargo ship built by SpaceX is expected to make the company's second operational flight to the station in early March while a similar craft built by Orbital Sciences Corp. is tentatively scheduled for its maiden flight in April. "We have about 130 experiments we're going to be running, so that's going to be the prime focus," Marshburn said. "No (U.S.) EVAs planned, but we're always ready if anything breaks to go outside. We're going to have a couple of spacecraft coming up, a couple of private companies will be launching cargo to us, so we'll need to get them on the (robot) arm for berthing. "But the main thing is going to be maintaining the science program and keeping that going." Ford, Tarelkin and Novitskiy have had the space station to themselves since Nov. 18 when Expedition 33 commander Sunita Williams, cosmonaut Yuri Malenchenko and Japanese astronaut Akihiko Hoshide returned to Earth aboard the Soyuz TMA-05M spacecraft. As it now stands, Ford and his two Russian crewmates will return to Earth on March 15 aboard their Soyuz TMA-06M spacecraft. At that point, Hadfield will become commander of Expedition 35. Nine Canadians have flown in space, one has made a long-duration flight aboard the station and three, including Hadfield, have participated in spacewalks. But no Canadian has ever commanded a spacecraft. "It's not that this flight is inherently so drastically different, it's Expedition 35 and there have been several Canadians to fly in space and Bob Thirsk has already lived on station," Hadfield said. "But the fact that a Canadian is going to command what is in reality the world's spaceship (shows) that Canada is now at a trusted level to be at the top of the space exploration game." Hadfield said the assignment was as symbolic as practical, adding that "I'm in the business, I understand the real perspective of what's going on, I know the huge support team on the ground, I know I'm the commander in between Expedition 34 and 36." "I understand the perspective of it," he said. "But that's irrelevant. The symbolism of it, the import of it, what it means to Canadians is palpably significant. "It has a big impact on Canada, on what kids are going to choose to do. When they see that 'hey, look what a Canadian is doing, wow, I can do that.' There is a direct impact from having a Canadian at this level doing something that is new in the Canadian experience. It just naturally inspires people to think about the possibilities that are out there." Hadfield is a veteran military pilot who flew twice aboard the space shuttle. But don't try telling him the much smaller Soyuz is not a complex spacecraft or that he and Marshburn are simply "hitching" rides to the station aboard a Russian ferry craft. "That is such a ridiculous, silly thing to say," he said. "We fly the Soyuz in Russian, and I have to be able to fly it completely by myself. If Roman gets (sick), I have to be able to fly the Soyuz, I have to be able to rendezvous it, dock it, undock it, redock it, undock it and fly it back to Earth, either with automatic or manual means, completely on my own, in Russian. "I'm a test pilot, I've flown a hundred different types of airplanes from simple one-person gliders right through to 747s and C-141s, F-18s, F-16s. And flying a spaceship is far more complicated than any airplane. The flight regimes are so unforgiving and the vehicle failure modes are so significant as a result that the margins are really tight. You really need to dig into it. If you don't understand what's going on, it's easy to trivialize it, just like anything." Hadfield believes there is "a profound bias in reporting and therefore just a lack of understanding that leads to people thinking that something that is right on the edge of capability is somehow simple, or easy, something you could just hitch a ride on. It's just comical for me to hear that." 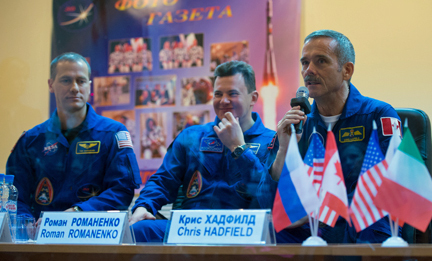 Marshburn said the Russian training was extremely intense and the Soyuz simulators very realistic. "You're in a spacesuit in a tiny spacecraft with all the panels, buttons, knobs, valves that you're going to have up there, and they will dump a lot of smoke in there, the lights will cut off, things that will really happen and will push you a little bit," he said. "You're uncomfortable, you're sweating, you don't have a lot of ventilation and you can't see anything. It's hazing in a way, but I think it's very useful to make sure you know how to get through those complicated procedures. I loved the training there." And he's really looking forward to doing it for real Wednesday. "It's beautifully designed," he said. "As the pilots say, it flies like a little sports car, so I can't wait to launch on it."